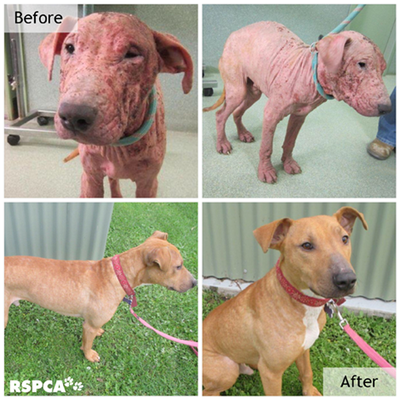 A dog named Rosko had one of the worst cases of mange the Victoria, Australia RSPCA staff had ever seen. Thankfully he was rescued and in good hands. He’s made a miraculous recovery and charges were filed against the canines negligent owner. They posted before and after photos to their facebook page along with the outcome of the court ruling against the owner. The owner was charged with failure to provide vet care and will not be allowed to own a dog for ten years, which is the maximum penalty. Rosko has since been adopted by a family that will make sure all of his needs are met, and he will never have to suffer again. Mange is a skin disease caused by parasitic mites. It is preventable and treatable and as you can see by the photos, Rosko feels a lot better now.